Returning to Quality Food means Eating and Drinking in a way that supports brain (and whole body) health. This is a critical part of the Healthy Brain program (HBp) and the Tinnitus Synergy program. Oh, yes, there is much we don’t know, but there are principles that have never changed. Those principles and and a few simple, measurable goals is how I will help you be certain your body and brain are being nourished well. How powerful can eating well be for your brain. A recent study makes this clear. 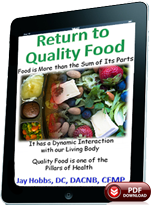 You will learn the principles right away in the “Return to Quality Food” audio and PDF document below. For more information on this, see the section on blood sugar in the “Return to Quality Food” document. Once you have purchased the subscription to “Return to Quality Food” or the more encompassing programs: the Healthy Brain program (HBp) or the full Tinnitus Synergy program, the program will be accessible on this page. What you Eat, Drink, and Breathe are VERY significant pillars to restoring and maintaining your health. If you would like to see how well you are doing now, take the Healthy Eating Quiz to find out what your score is. 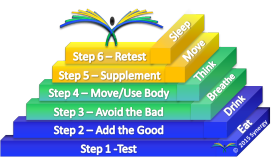 It is available for free here as the entire Healthy Brain Score that checks all 6 pillars and gives you recommendations for each, as explained in our Healthy Brain Program, or as a more convenient, quick quiz that comes with the Return to Quality Food, our healthy eating program. The M.I.N.D. diet – Alzheimers Dement. 2015 Sep;11(9):1015-22.